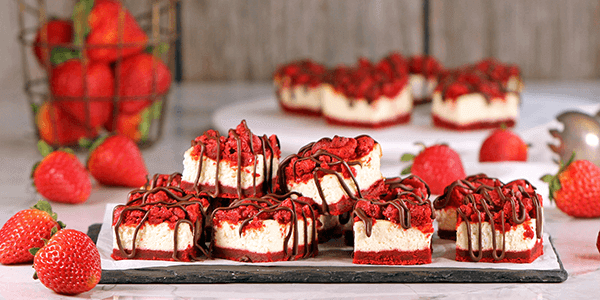 This visually stunning recipe is a great party dessert and is quick and easy to make. A buttery, flaky pastry laced with cocoa makes the base for a simple-yet-decadent, vanilla cheesecake filling. The topping is additional red velvet pastry dough crumbs, baked to crisp perfection, with a drizzle of sugar-free chocolate. Prepare the pastry: preheat the oven to 325F. Place the almond flour, arrowroot, Sola sweetener, cocoa powder, and salt in the bowl of a food processor and process until combined. Add the butter and pulse until the mixture resembles pea-size crumbs. Add the egg white-water mixture and red food coloring, then continue to pulse until you have a smooth batter. Line an 8-inch, square baking pan with parchment paper. Place 2/3 of the pastry batter on the paper and spread it out using the back of a spoon (the bottom of the pan should be evenly covered). Place the baking pan into the oven and bake for 10 minutes. Place the rest of the pastry batter between 2 layers of baking parchment and roll out to approximately 1 inch thickness, and place into the freezer to harden for about 20 minutes. Prepare the filling: Place the softened cream cheese (it’s important that it is softened so you don’t get lumps) and Sola sweetener in a large mixing bowl and whisk until smooth. Add the eggs and vanilla extract, whisk until smooth, then pour into the baking dish, and smooth out with a spoon. Place the pan into the oven and bake for 20 minutes. Just before the 20 minutes of bake time is up, remove the remaining pastry from the freezer and crumble up into small pieces using your hands. Remove the cheesecake from the oven at the 20-minute mark, and sprinkle the pastry crumbs evenly over the top, then sprinkle 2 tablespoons of Sola sweetener over the top of the crumbs. Place the cheesecake back into the oven to bake for a further 20 minutes until the filling is set. Remove the pan from the oven and cool to room temperature, then place in the refrigerator to fully chill for at least 2 to 3 hours. Remove the cheesecake bars from the pan and cut into 16 squares, drizzle over the melted chocolate, and serve. Store the bars in the refrigerator.